The greenback has a new face in Asia Pacific (APAC) — WeChat. According to GlobalWebIndex (GWI), operator of the world’s largest study on digital consumer behaviours and trends, WeChat has doubled its usage rates in APAC since the first half of 2015 to the first half of 2016. GWI also reported insane growth numbers for Wechat — 300% in South Korea, 284% in Australia and 150% in Philippines. 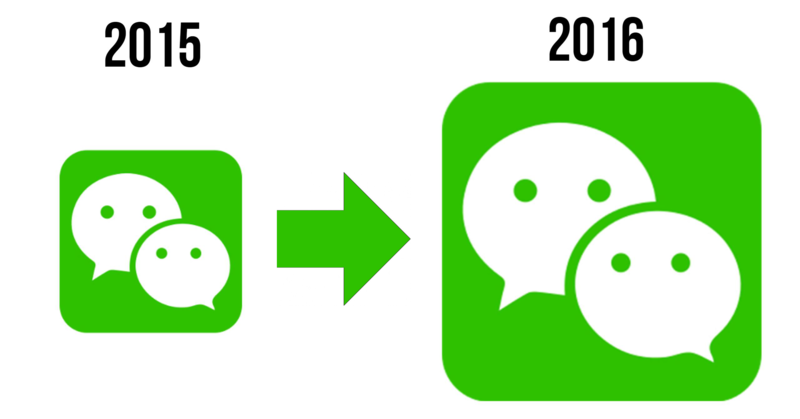 It definitely looks like WeChat has transitioned well from their home market as they continue to achieve success. 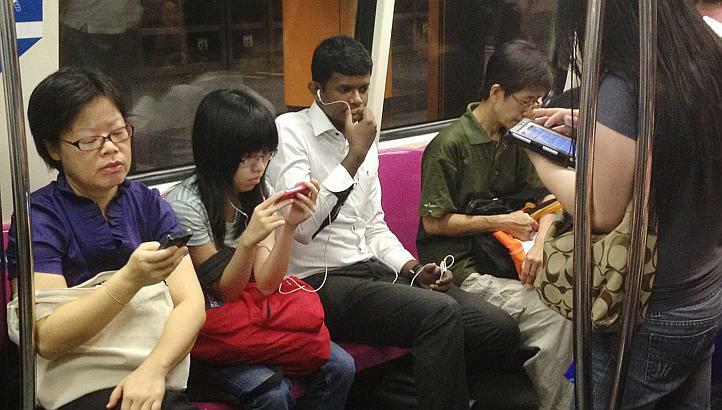 Why has WeChat become so successful in APAC? Does their size lend to the much needed authority in a relatively green internet market? It turns out that the answer is simple: WeChat is consumer-oriented and it has the most features, tie-ins and the partners in the market. 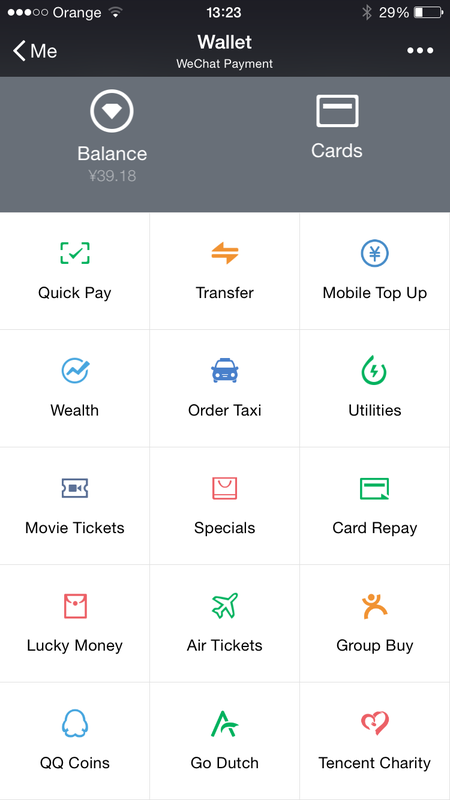 Localisation and a wealth of features in the messaging app that makes users go “Oh, I didn’t know I needed that” means that WeChat is ahead in terms of innovation. Compared to alternatives like Whatsapp and Line, WeChat enjoys very little competition in doubling up as an social network and an online ID similar to Facebook. The convenience of being able to use one WeChat ID for multiple purposes also makes membership all the more appealing. Think “Log In with Facebook” and then apply that to WeChat. Comparatively, a WeChat ID feels more native to mobile compared to the rather clunkier Facebook app, allowing WeChat to continue edging Facebook out in APAC. “The gains WeChat has made in the last year were made possible by staying true to our core value – creating great user experiences. WeChat is committed to building a robust eco-system by bringing together user-centric features from messaging, gaming, entertainment and media content to payment. By designing a superior and complete consumer experience, WeChat’s consumers are extremely sticky — resulting in WeChat posting higher usage scores than other messaging apps in Australia, Hong Kong, India, Philippines and Singapore. According to International Data Corporations APAC, our region is poised to hit US$1 trillion in mobile payments by 2017. WeChat’s consumer-centric business is all about about making consumers feel protected and thus earning their trust. 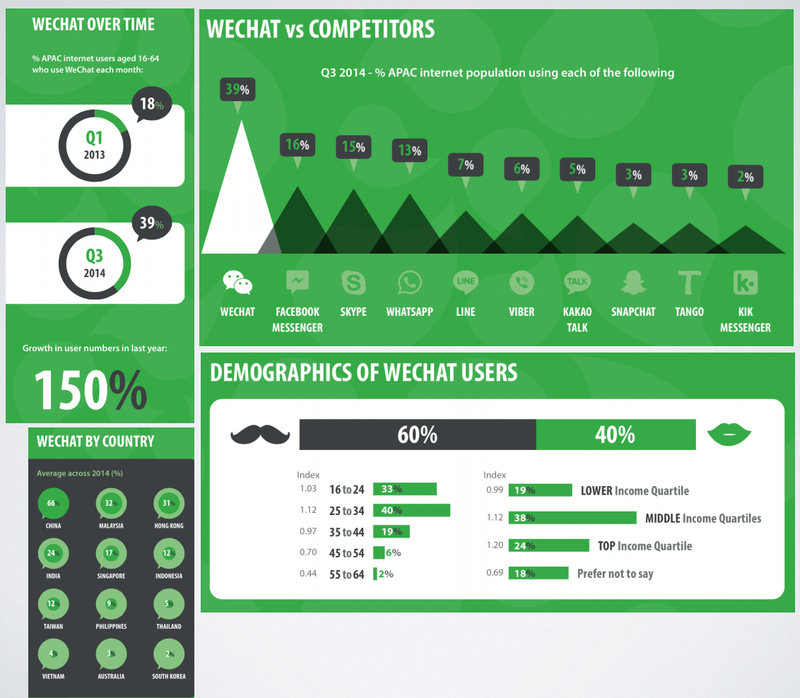 In doing so, WeChat is paving the road for WeChatPay to hit the APAC market as a reputable service. GWI also revealed that 3 in 4 WeChat users are under 34, with a 1 in 3 of them aged 16 – 24. With Millennials as their main consumer base, WeChat is poised to dominate markets for the next two decades. An average of 3.5 hours are spent on mobile internet per day, says GWI. This means that Millennials spend about a fourth of their waking hours on consuming digital content. As an avid mobile user myself, I found that most of my time on mobile is centred around leisure activities like gaming, shopping and browsing. With 87% of WeChat users shopping online, my hunch is more less confirmed. A large portion of Millennials are regular e-commerce users, which WeChat is capturing with their WeChat store. By entering APAC with their well-tested e-commerce tie-in, WeChat outclasses local apps due to their reach and design. This is currently allowing them to dominate the nascent e-commerce markets in countries like India, Philippines and Malaysia. 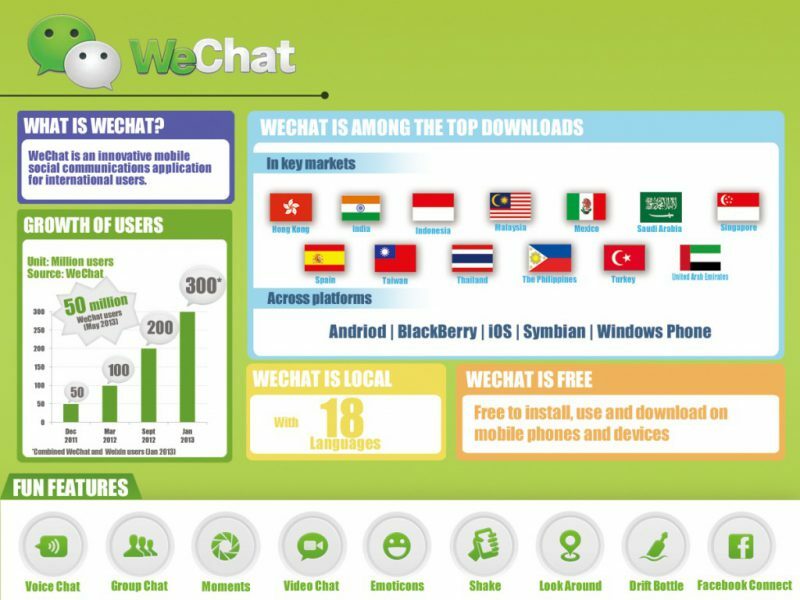 In Malaysia, 65% of WeChat users access the platform each day, and 55% of internet users use it at least once a month.